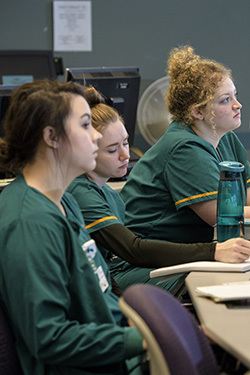 Why Choose the Administration of Nursing and Health Care Systems Concentration? The purpose of the concentration is to prepare individuals for nurse executive or administrative positions in a variety of health care settings. Benefits of the Master of Science in Nursing degree include allowing graduates to demonstrate sound decision-making based on organizational, economic, leadership and nursing theories. The concentration consists of 13 credit hours of core nursing courses with an additional 21 credit hours of nursing administration courses. All students are required to complete a graduate level statistics course prior to NUR 7005: Nursing Research and Evidence for Practice course. This concentration has a rolling admission with no specific deadline. Please see sample full-time pattern below. Individualized plans, including part-time, will be developed on admission by the associate director of the concentration. If desired, an online option for this concentration is available. Apply to Wright State Graduate School. Provide evidence of no criminal history record on file from both a Federal Bureau of Investigation and an Ohio Bureau of Criminal Identification and Investigation (or applicable state) background check. Please be aware that background checks may take up to 30 days to process. It is to your benefit to complete the background check one month prior to the College of Nursing and Health application deadline. Background checks can be done in the Educational Resource Center at 116 Allyn Hall. The results must be sent to College of Nursing and Health, 160 UH, Wright State University, 3640 Col. Glenn Hwy, Dayton, OH 45435. Keep in mind it takes 2-6 weeks to process an application in the Graduate School. When your application materials have been received, you will be contacted to interview with the Director of the Administration of Nursing and Health Care Systems concentration.